Hi blogosphere! I've been absent from the blog these last few weeks, partially because I took the kids on a mini vacation and prepping for it beforehand is almost as much work as the actual traveling. Now that I'm back I want to get caught up on some of the things I saw and liked online/social media. 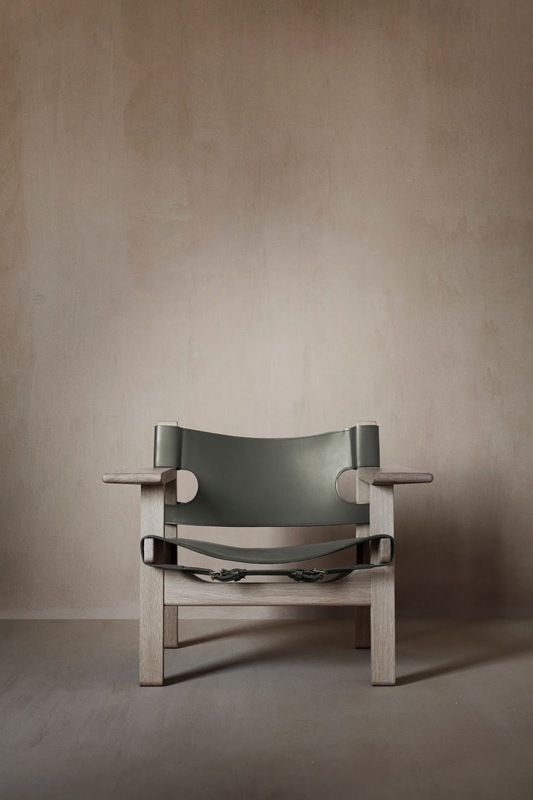 Fredericia's iconic Spanish Chair celebrates 60 years now and in honor of this anniversary Fredericia has released a solid oak version combined with an elegant Olive Green saddle leather. To come up with this color Børge Mogensen's archives were searched to find this subtle color, one of his most loved hues and one of the dominating interior colours at the time. They also the invited Børge’s grandson, renowned fashion photographer Rasmus Mogensen, to portrait himself with the masterpiece created by his granddad in 1958.